Let’s dispense with the flowery-ness. This is, quite simply, a totally kickass Napa Valley Chardonnay from SF Chronicle and Food and Wine Magazine “Winemaker of the Year” Steve Matthiasson (Google him). That’s it. I mean, it’s just delicious, mouth-watering and perfect. We promise. The winery is winding down its production, and we were proud, nay, STOKED to get some of the last vintage at an astounding price. This is just EXACTLY what you want after a long day at work, at home, gardening, skydiving, raising kids, saving for retirement, Snapchatting, cooking something to eat, doing laundry, playing drums, climbing Mt. Whitney, learning Chinese, or going on a multi-city book tour. Yeah, any of those things. Plus 42,000 other things. It’s just WHAT. YOU. WANT. This vineyard is one of the most unique terroirs in all of Napa. Perched on a hillside of fractured rock, and shrouded with morning fog and afternoon sea breezes, the Castrucci vineyard is like no other vineyard I've experienced says winemaker Steve Matthiasson. At the southeastern mouth of the valley, it looks over the San Pablo Bay straight at the Golden Gate and the Pacific Ocean. The rocky soil and western exposure drives ripening, but the cool climate maintains freshness and acidity. This results in wines with a lot of depth and character, but zesty mineral freshness. David Castrucci along with his wife Dawn and their 3 children purchased the property in 2011. Finding the right people to farm and eventually make wine took another 2 years. Jason Ray is Steve's great friend and confidant in vineyard work. Jason has worked with Matthiasson on vineyard work for over a decade. Outside of Steve's Estate in Oak Knoll, the Castrucci property is the only other Estate parcel that Steve Matthiasson is in autonomous control over. It all started back in 1998 when we moved our family from New England to the San Francisco Bay Area. It wasn't long before we discovered (and fell in love with) the wonders and beauty of the Napa Valley. Through curiosity and passion for good wines, we started to learn more and more about the famous world of wine that grasps this region of Northern California. 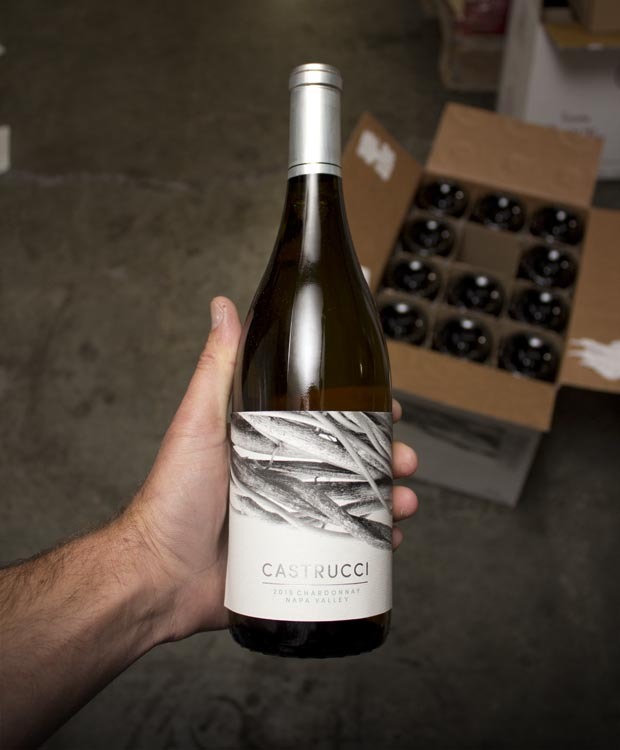 Our love for this fascinating industry led us to purchase a vineyard property, now Casturcci Vineyards, in 2011. We started by dipping our toes in. We began by selling our fruit from the property to local wineries that first year. Based on the positive feedback we were receiving about the quality of the fruit, we decided to take on the fascinating challenge of making wine ourselves in 2013. Around this same time we were introduced to Steve Matthaisson. Immediately upon discussing wine with Steve, it became very clear that we shared some of the same feelings and thoughts about wine. We were very excited to have him join the Castrucci Wines family as our winemaker. Our first Castrucci Wines harvest took place during the fall of 2013 and we've been going strong, increasing production year over year, ever since. We are excited to be combining great fruit with the skills of a very talented winemaker, with the ultimate goal of producing outstanding wines we can be proud of that ring true to our values and beliefs. Mushrooms (not the magic kind). But a nice Mushroom Risotto or Mushroom and Ricotta Bruschetta. Also, goes nicely with boiled Lobster, Poultry and Vegetarian dishes.